Since its release in 1989, The Sandman has been listed as one of the most challenged comic series by the American Library Association. 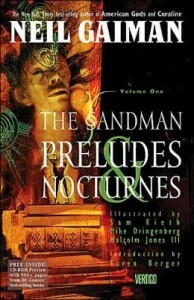 Despite its critical acclaim and numerous awards, Neil Gaiman’s epic series, spanning 75 issues and inspiring a variety of spin-off series and collected editions, The Sandman still faces censorship — the most recent case was a rare higher education challenge at Crafton Hill College in California, where a 20-year-old student and her parents demanded that The Sandman and other graphic novels be “eradicated” from an English Literature course curriculum for their “pornographic” and inappropriate content. In hopes of preventing any future bans of The Sandman, we’ve put together these resources for librarians and educators who may need to justify and defend the inclusion of the book in library and classroom collections. The Sandman is the universally lauded masterwork following Morpheus, Lord of the Dreaming — a vast hallucinatory landscape housing all the dreams of any and everyone who’s ever existed. Regardless of cultures or historical eras, all dreamers visit Morpheus’ realm — be they gods, demons, muses, mythical creatures, or simply humans who teach Morpheus some surprising lessons. Upon his escape from an embarrassing captivity at the hands of a mere mortal, Morpheus finds himself at a crossroads, forced to deal with the enormous changes within both himself and his realm. His journey to find his place in a world that’s drastically changed takes him through mythical worlds to retrieve his old heirlooms, the back roads of America for a twisted reunion, and even Hell itself — to receive the dubious honor of picking the next Devil. But he’ll learn his greatest lessons at the hands of his own family, the Endless, who — like him — are walking embodiments of the most influential aspects of existence. Neil Gaiman’s The Sandman was launched in 1989. This extremely popular series was bound into ten collections. Following Dream of the Endless, also known as Morpheus, Onieros and many other names, we explore a magical world filled with stories both horrific and beautiful. This description fails to describe the intricate twinings of story, the threads that run through each book as we revisit past characters, as past events blossom into new ones. It also does not give credit to the magnificent collection of artists that lent their talent, their own distinctive voices and styles, to Neil Gaiman’s words. The scope of this series is broad, touching on aspects of our own brief lives. To read this series is not to curl up with a simple comic book, but to take a journey beyond the shores of reality and into a world we may only visit when we close our eyes. The Sandman is available in a variety of editions, including a 10-volume graphic novel format, an oversized 4-volume Absolute Edition, and a 2-volume omnibus edition. There are also a number of tie-in graphic novels featuring various characters from the series. There are many followers of Neil Gaiman who feel that his Sandman graphic novel collection is his most perfect work. Undoubtedly the most well known of his creations, the Sandman chronicles the life of Dream and his immortal family the Endless. Any of the eleven novels can be read alone or in order as all the stories stand apart. Volume five features the story of Barbie. As a little girl Barbie used to imagine herself a princess with animal subjects in a magical land but as an adult she never dreams. Soon, her imaginary world begins to encroach on the real world. This is a strange tale of reality versus fiction, gender and identity, and the roles we play as children and adults. Download a PDF of the discussion guide for Preludes and Nocturnes here. Download a PDF of the discussion guide for The Doll’s House here. Download a PDF of the discussion guide for Dream Country here. Download a PDF of the discussion guide for Season of Mists here. What should I do if The Sandman is challenged?